Fast-casual specialty brands are on the rise in general. But when you add simple, classic brand appeal of Dogtopia, you have many opportunities to capitalize on revenue growth. Services like spa, training and retail are built into Dogtopia’s franchise model. We also participate in VetFran to support our armed forces. Interested in claiming an entire region? Now is the time to take advantage of our discounts on multi-unit purchases. According to Forbes, an astounding 92% of pet owners spent the same or more on their pets during the most recent recession period. No matter the economy, people love their pets. And more than ever, people are looking for dog daycare and services. 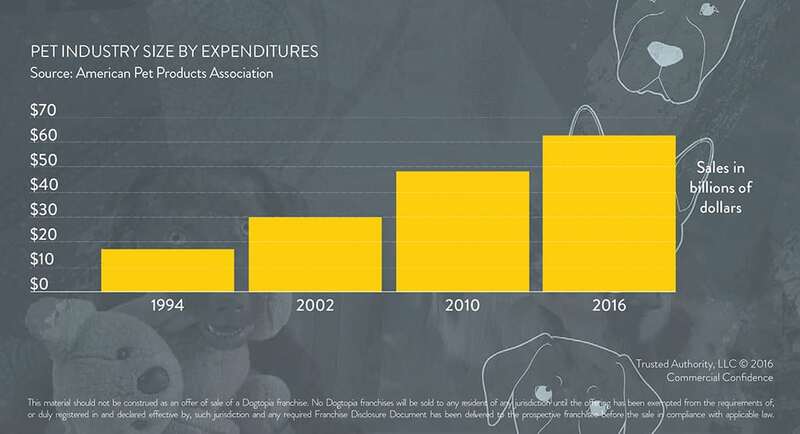 As an emerging brand, Dogtopia is experiencing impressive growth. The demand for our brand, flexibility of our model and the availability of prime territories is fueling our growth. There has never been a better time to join us and be the first to bring Dogtopia to your community. 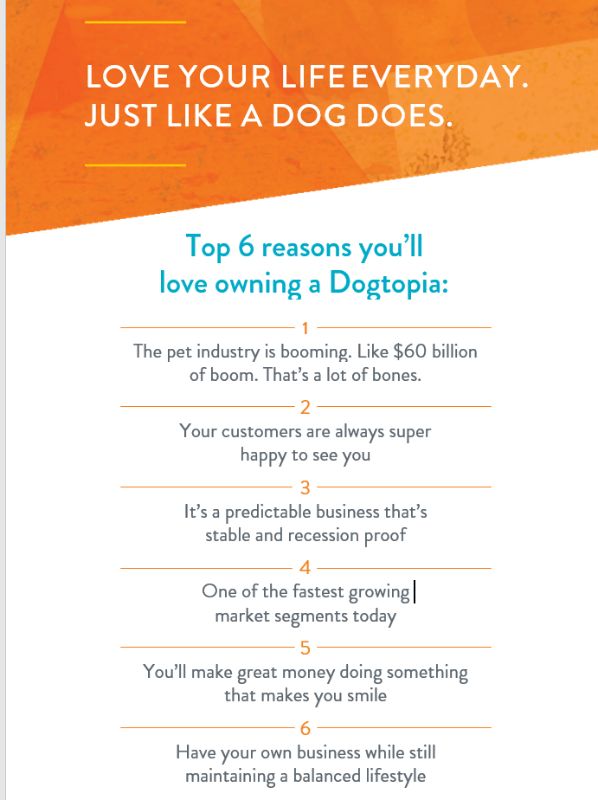 One of the prime benefits of teaming with an emerging brand like Dogtopia is the ability to cherry pick prime markets to open your Dogtopia. Unlike other more established systems, you won’t have to compete with other operators for locations. You have the chance to own your own Dogtopia where you know people and have connections. Imagine opening your Dogtopia where you want it. So, what are you waiting for? Our leadership team has had direct experience with some of the top franchise brands like Century 21, Gloria Jeans Coffee, Brinker International and Papa John’s Pizza. In fact, the combined franchise experience of our team is more than 150 years. So don’t worry, you’re in good hands! 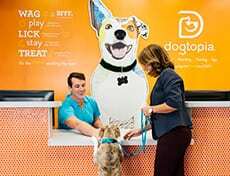 The average initial investment for a Dogtopia is $454,437 in the U.S. and $515,150 in Canada, including the initial franchise fee of $49,500. The initial franchise fee for multiple units may be discounted based on certain conditions and criteria. Dogtopia was one of the early pioneers in the dog daycare industry. That means we’ve have more than 14 years to refine and perfect our model. And we continue to operate four stores ourselves as company-owned units. We know how to make daycare a profitable and economic windfall. Come join us and grab your share! NOTE: This website is not a franchise offering. A franchise offering can be made by us only in a providence, if we are first qualified to offer franchises in that providence, and only if we provide you with an appropriate franchise disclosure document. Follow-up or individualized responses to you that involve either effecting or attempting to effect the sale of a franchise will be made only if we are first in compliance with all providential requirements.